There are many movies glorifying extreme winter sports--showing top athletes going big--but the responsibilities and potential consequences are never shown. "Winter Aware" has the exciting action and music but mixes compelling interviews of the athletes sharing tips and advice for staying safe in the mountains. 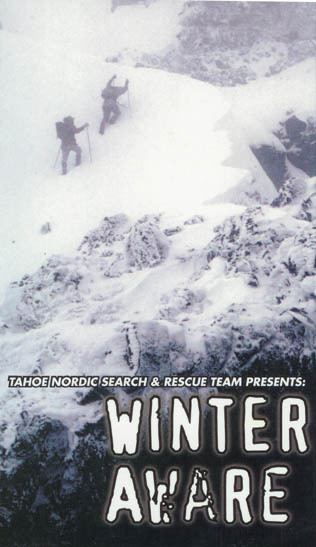 This video, presented by the Tahoe Nordic Search and Rescue Team, has a message of personal responsibility targeted at a High School age group, in their own language. The Winter Aware video, with associated Educational material (you can download the Review Questions and Review Answers), is free for educational, non-commercial, non-broadcast purposes. Please email TNSAR if you would like a free copy. Check out the historical perspective on the goals, objectives, and the effort involved by TNSAR in getting this video produced. In 2010 TNSAR updated the video, with more information and more athletes yet in a shorter time frame (about 35 minutes).